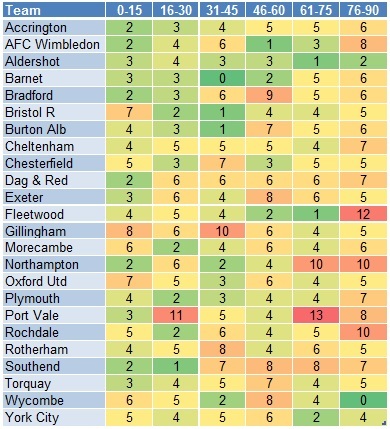 In part 1, I have compared Northampton’s performance with other teams in League 2. It was clear that Northampton was strong in set play, particularly throw-in. Over 50% of their goals were from set play. In their set play goals, around 40% of them came from throw-ins. I will focus on analysing those 13 throw-in goals in this piece. 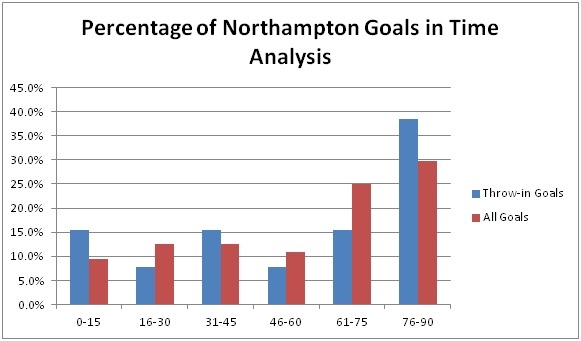 No matter we consider the throw-in goals or all goals of Northampton; they both fit the general trend of time analysis in League 2 because more goals were scored in the later stage of the game. However, the key point is about the time slot of 76-90 minutes. 29.7% of goals were scored in this time slot in all goals. On the other hand, 38.5% of throw-in goals were scored in this time slot considering that the percentages in other time slots were only 15% at most. It shows that throw-in was an effective strategy for Northampton to use in the last 15 minutes of the game to score goals. What were the assist styles? Considering the assist styles, some teams may choose to do flick-on headers to make assist. In Northampton’s case, the best way to make assist is to make a direct throw-in passing by hands. 84% of the throw-in goals were assisted by hand passes, only 8% of them were assisted by flick-on header. It also means that at least 84% of the goals were scored by one-touch shot. The technical ability to make one-touch shot is one of the keys to score throw-in goals. Many people may link throw-in goals to headers but it is not the case in Northampton. Even we found out that one-touch shot is important, the above chart shows that using feet to shoot is as important as header in scoring throw-in goals. Header goals were only 8% more than feet goals. If we consider the above two charts together, we realise that considerable amount of goals were scored by hand passing throw-in followed by shots made by feet. It may be a result not expected by some people. Where were the assists made? Since 84% of assists were from direct hand throws, only 7.7% of assists were from central area by flick-on header. It is worthy to note that 30.8% of assists were outside 18-yard from the goal line. 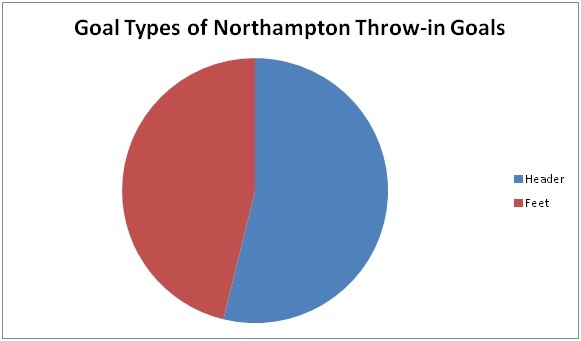 Some teams may only use long throw tactics near penalty area but Northampton’s statistics show that it is worthy to do long throw outside the penalty area also. Who scored the most throw-in goals? Northampton did not rely on any particular player to score throw-in goals as the goals were widely distributed to 8 players. A Akinfenwa is the player who scored the most with 31% of throw-in goals considering he is a striker. The other 7 players scored 1 goal each. It is worthy to note that 15% (2 goals) were scored by own goals. It shows that one of the advantages in using long throw-in is to mess up the situation in penalty area so the defenders would have a higher chance to make a mistake scoring own goal. The above diagram obviously shows that the prime area for attacking long throws is the 12-yard area from the goal line. 84.6% of goals were scored in these two zones. Note that 15.4% of goals were scored outside the penalty area. My explanation is that most of the defenders would try to defend long throw-in by staying at the zones in front of the goal. It leaves space outside the penalty area for attackers to make long shot. It is worthy to note that no goal was scored in 12-18 yard area. It is because this zone is neither close enough for one-touch shot in long throws nor having enough space and time for players to make long shot. 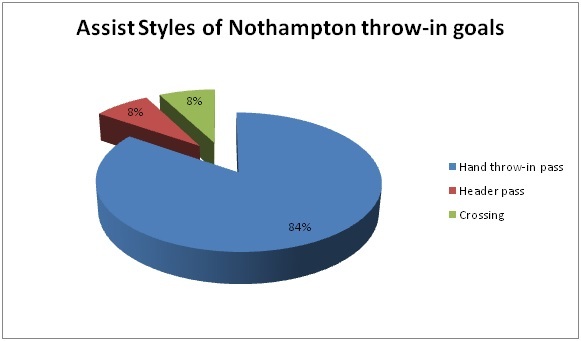 By analysing Northampton’s strategy in throw-ins, we can identify why they are so strong in scoring throw-in goals. Firstly, they used a very direct style to attack. They didn’t prefer flick-on header as 84% of assists were came from direct hand throw-in passes. Secondly, one-touch shot is the key to score but we should be aware that using feet to score is almost as important as using header. 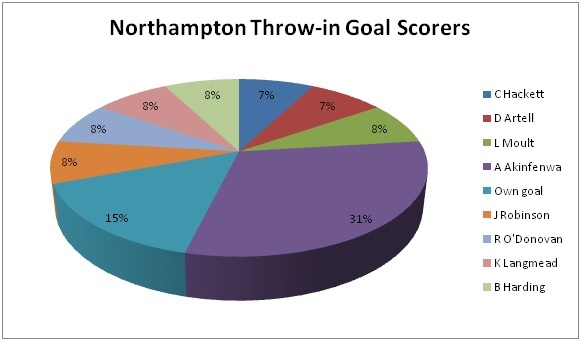 Thirdly, Northampton did not rely on any particular player to be the target man to score throw-in goals. They had 8 players to score 11 throw-in goals (the other 2 goals were own goals). 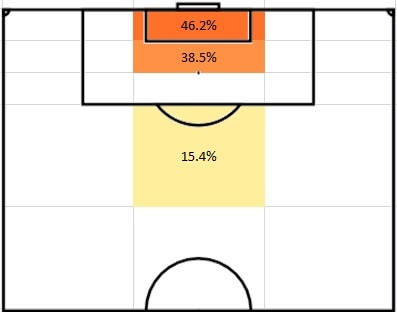 Fourthly, don’t ignore the importance of making delivery outside the penalty area (18-yard line) because 30% of their throw-in goals were delivered from zones outside the 18-yard line. There were 1411 League 2 goals in the 2012/13 season. This article will focus on the time at which goals were scored during match play. These are important information because it shows the characteristics of different teams. I did a time analysis once in December, 2013. That result showed that there was a systematic and significant upward trend in the number of goals scored as time progressed. This time all the goals in 2012/13 season were included and the upward trend is still the same. It further supports the previous research suggesting an increase in the frequency of goals scored as a match progresses (Jinshan et al., 1993; Reilly, 1996). 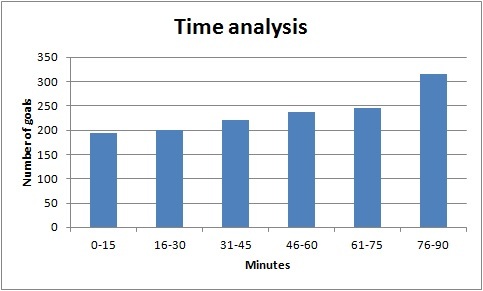 The methodology is the same as I divided the 90 minutes into six 15-min periods. 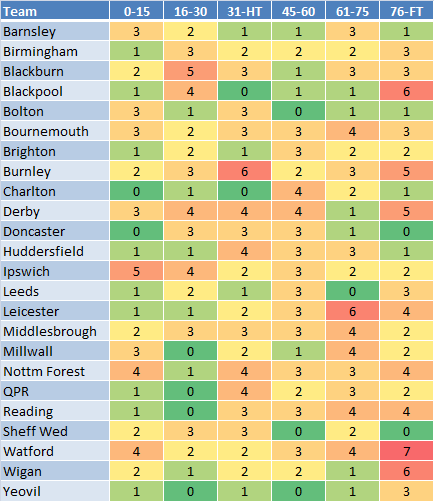 The following chart shows when the 1411 goals were scored in League 2 this season. The goals scored in the last 15 minutes of the game were obviously more than other periods. Gillingham, Wycombe and Bristol Rovers were the teams which started the game strongly in the first 15 minutes by scoring 14, 13 and 12 goals. Gillingham showed a special characteristic as they scored more goals in first half (39 goals) than second half (27 goals) significantly. They scored least goals in the last quarter (7 goals) which was different from the general trend of other teams which scored most goals in the last quarter. York City was another team having the same characteristic because their first half goals (31) were much more than that in second half (19). Northampton scored most goals (19) in the last quarter but generally most of the team scored more goals in the last quarter so the difference was not significant. Port Vale showed something special as they significantly outperformed other teams in the second quarter (16-30 mins) by scoring 17 goals while most of the teams had less than 10 goals in this period. Wycombe was a special team as well because they were particulary strong in the first 15 minutes of the halves by scoring 12 goals in 0-15 and 45-60 minutes. In other periods they scored only 6 to 7 goals. However, if we just count the goals scored, it is not showing the whole picture of analysis because stronger teams scored more goals (e.g. Port Vale scored 87 goals and Aldershot scored 42 goals). If we want to find the characteristics of the teams, we have to convert these data into percentage which is shown by the following table. 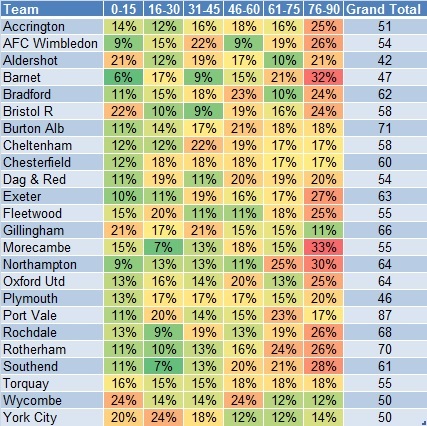 Only 5 teams scored 20% or more goals in the first 15 minutes of the game and they were Aldershot, Bristol Rovers, Gillingham, Wycombe and York City. 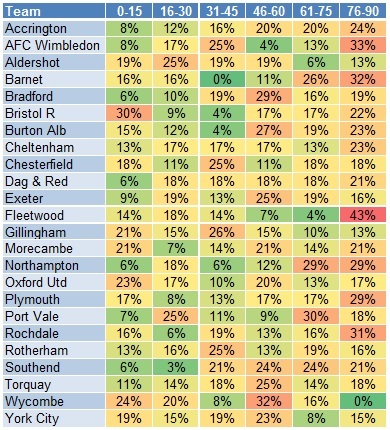 AFC Wimbledon, Cheltenham and Gillingham were stronger in the 15 minutes before the first half break as they had 22%, 22% and 21% of goals in that period. Barnet was the weakest team in the first 15 minutes (6%) but they were very strong in the last quarter with 32% scored within the last 15 minutes of the game. 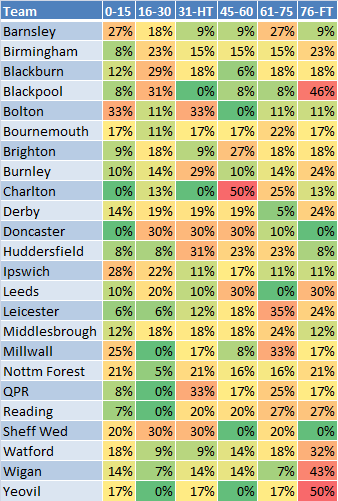 Morecambe and Northampton were the two remaining teams which had more than 30% of goals in the last quarter. 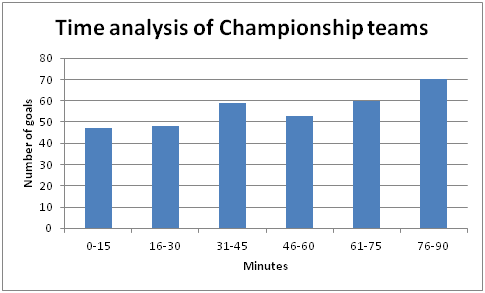 If we consider the last 30 minutes of the game, the characteristics of these teams were more significant. Barnet and Northampton had 53% and 55% of goals scored in the last 30 minutes of the game and these could be important information for their opponents. 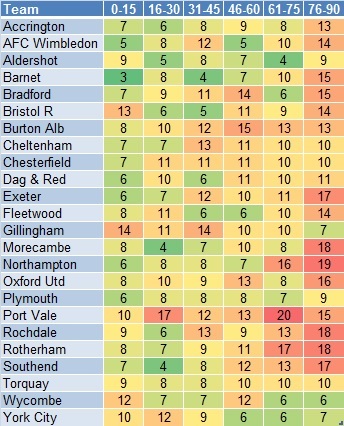 Aldershot and Bristol Rovers shared the same characteristic as they were both strong in the first and last quarters having more than 20% of total number of goals. The team with the most evenly distributed number of goals in all six quarters was Torquay. They had around 15%-18% of goals in each quarter. To conclude, the characteristics of the teams could be shown by having the time analysis. Some teams were stronger in the first half (e.g. Gillingham and York City). Some teams were stronger in the last 30 minutes of the game (e.g. Barnet and Northampton). These information would be useful for the opposition analysis to know the strengths and weaknesses of the opponents.